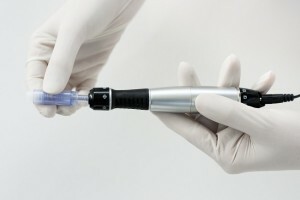 The Dr Dermic pen is a microneedling device. It has an 11 pin head with adjustable depths and speeds. The high speed of these needles considerably reduces treatment time; this decreases patient discomfort and speeds recovery. The Microneedle Cartridges are single use, which eliminates the risk of infection and are more cost effective than traditional rollers. “Ann provides a very friendly and helpful service, orders are despatched quickly and she is always available to answer questions. On looking for off-standard rollers for our clinic she couldn’t have been more helpful and found us exactly what we needed. Mariga Sheedy, Skin Essentials Ltd.
Mariga Sheedy Skin Essentials Ltd.
Ann Hand recently introduced me to the Dermica Pen. As a nurse I feel it is a more professional and a safer way to perform micro needling. The Dermica Pen is a surgical grade needling device which be adjusted to different depths and speeds allowing me to tailor treatments to my patient’s specific needs and concerns. I have found that my patients find the treatment more comfortable than previous treatment methods and are really happy with the results. I have been using the Dermica Pen since November 2014 and have found my business has grown beyond my expectations. I’m getting are amazing as well as very happy clients. My best seller is Stretch Mark removal at the moment as Summer is here. which means you can order at any time. – Gina Stokes, Laser Ireland Ennis. Gina Stokes Laser Ireland Ennis. “I first met Ann in November 2014 when she came to my salon in Dungarvan Co. Waterford to do a demonstration of the Dermica Pen on myself. Marcelle Crotty Marcelles Beauty Room, Dungarvan.